Take a ride with High Point Hummer on Moab’s most exciting terrain. Experience the world famous Hell’s Revenge Trail, guaranteed to raise your eyebrows, we will show you what a HUMMER® is built to do. 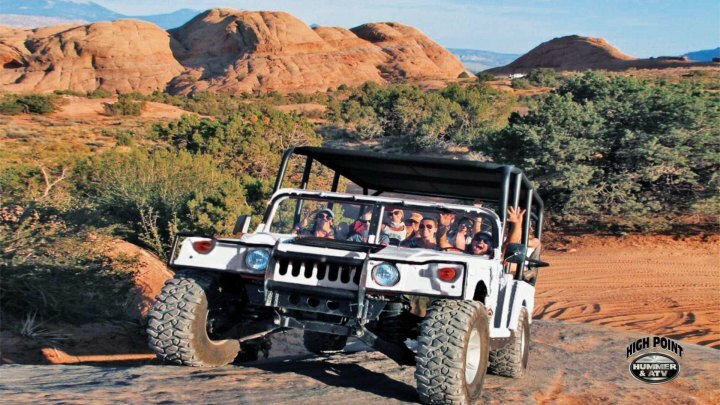 HIGH POINT HUMMER & ATV features exciting excursions to secluded canyons, hidden arches, prehistoric dinosaur tracks, and awe-inspiring panoramic overlooks of Arches National Park and the Colorado river. Experience the thrill of traveling up and down rolling petrified sand dunes as you ascend to the top of the Slickrock surrounding Moab. Our professional guides provide the whole family with memories that will last a lifetime. Truly an adventure for all ages!